In our class we are part of a fantastic "We Can See" blog project created by Joanne Babalis as inspired by Angie Harrison. These two teachers (along with a host of others on my twitter PLN), continue to inspire me to find ways to expand student learning through creative use of technology, specifically social media. My AM and PM class combined ideas to create three three "We Can See" books together, and these texts are enjoyed both as a printed document and a blog post to be shared again and again. My students love to share their questions and comments with other students whose books are shared in the blog. 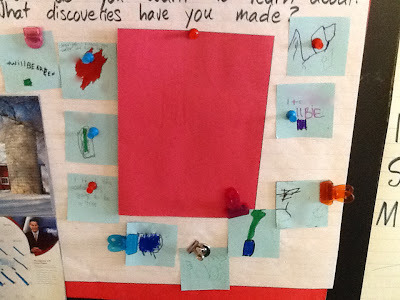 They make such authentic, interesting connections to what they see and hear from other Kindergarten students, some very far away indeed. 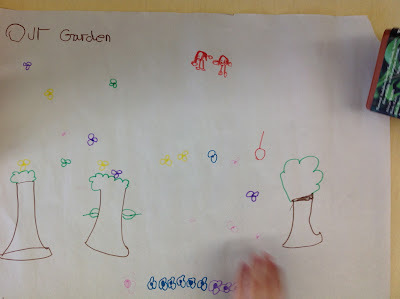 One of the most touching connections for my senior "butterfly" students (juniors are "caterpillars") was when their dear teacher Miss Metcalfe joined the blog with her new FDK class at her new school. I am new this year to Thornwood PS, and those butterfly students were very curious about seeing their teacher from last year: where she teaches, what her school looks like, what her students write about. Several students wrote her letters or drew pictures for me to send after they saw Shelter Bay PS's "We Can See" blog post. Several other participating classes have submitted student self-made "I Can See" books, including stories about trips taken to faraway places: India, China, the United States. In a half-day program time is always short, so there was a while when we didn't visit the blog, when we read great picture books or focused on in-class writing instead. I finally made time in March, after our break, to share some of the individual stories that so inspired me. My students were particularly excited by a trip to Florida by Benn. The room was abuzz with conversations about amusement parks, Disney on ice, crocodiles, and dragons. They also liked seeing James's I Can See book with its fun, bouncy Louisiana marching band music and scenes of late winter in Ontario, and Cayden's self-illustrated book which sparked an interest in illustrating books in my morning class. I let students know that I would be happy to help someone tell their "I Can See" if they wished to share on the blog. I dropped broad hints, but at first no one took me up on my offer. Sharing in class is a daily part of our class routine. Students sign up on the sharing space: post-it notes, labelled diagrams, pictures and paintings, paper creations. Students stick predictions to our sharing space during our celery experiments. S and T collaborating on a poster about trees and flowers, using a tree field guide. They later shared with class. This week I planned to share these wonderful stories with my afternoon class, but as is often the case in a curiosity-driven curriculum, new ideas came up first. A morning friend suggested we make a "We Can See" book, not about spring, thus following the pattern of our first two books, but instead about birds. The bird inquiry has grown to include more than half of the students in each class, as artifacts gather on the sharing space and my class site. The afternoon friends, avid birdwatchers, have jumped on this idea and our newest class Voicethread has been born. But that will be a story for another day. Addendum: If you teach in Peel and have the chance to attend one of Tina Zita's technology workshops, don't miss out! It was an instruction technology workshop a few years ago that first inspired me to let out my hidden geek (at school, I should say). Her presentation introduced me to Comic Life (which I used for our first two "We Can See" books), Voicethread, prezi, and more. That year I made it my annual learning goal to learn and use all of them, and I have to say it was the best thing I've for my teaching. Embracing various technologies have allowed me to ease into documentation, co-creation of big projects, sharing our learning outside of our classroom, and with joining twitter last year, the creation of an incredible PLN. If you are a Kindergarten teacher in Peel and are attending the Kindergarten Conference in May, do stop by to say hi to me (tent) and also make a trip to meet the dynamic Tina Z, who is presenting about the wonderful ways of embracing technology in our practice in Kindergarten. Thank you! I loved sharing the individual "I Can See" books. My students have enjoyed making the class books, but seeing the students in other classes share their storied truly inspired my kids to share with a whole new audience. I am still in the midst of our bird inquiry, but collecting many exciting artifacts and photos for our Voicethread bird book. We will be sharing some time soon.